Whether new to our program or a returning member, there’s a lot of good information on this page to help you have a smooth registration experience. 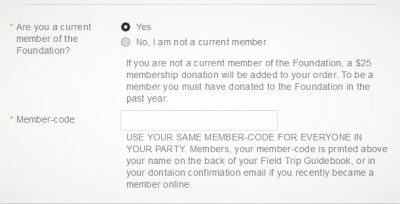 First step: You must be a current member of the Foundation in order to register for our Field Trips. Become a member of the Foundation with a donation of $25 or more. Click here to become a member. Second step: You will receive a Member-code in your donation confirmation email that you can use during your online registration. Your member-code is also printed in red on the back cover of the Field Trip Guidebook. Click here to view our Field Trip Guidebook online. A paper booklet will be mailed to you after your online donation, but this can take up to a week. View online now to select your trips before the opening of registration March 27. Fourth step: Register online starting at noon, March 27. We do not accept phone registrations. A link for registration will be posted on our website starting March 27. Last step: Enjoy exploring Wisconsin! We will email you details and directions two weeks before your trip date(s). Our online registration site can be a little tricky–so we have posted help below so you have a smooth registration. Don’t miss the tutorial video below– updated for 2019! 1. Be sure ALL your trips are in your cart, and quantities updated, before you click the orange “Continue” button. 2. Use the filters at left on reg site, or calendar view, to easily find trips. 3. Trips are listed in order of dates they occur. So session B is not always listed following session A if it is on a later date. 4. If you don’t know guest’s birthday, or uncomfortable entering real birthdays, use the b-day: 01/01/2000. 7. If you did not register with us in 2018, you do not need an Active.com password to register for Field Trips. You will create an account and password when you check out with your registration. *Registered in 2018 but do not remember the Active.com password you created? —Before noon, March 27: Click on this link, enter your email and click “forgot password” and Active.com will send you an email to reset your password that you can use during your 2019 Field Trip registration. —During your 2019 Field Trip registration after noon, March 27: when checking-out with your 2019 Field trips, click “forgot password.” An email will be sent to you to reset your password before you can proceed to finishing your Field Trip registration. If you did not register with us in 2018, you do not need an Active.com password to register for Field Trips. You will create an account and password when you check out with your registration. Have More Questions? Click here to Read FAQs! There isn’t a way to “practice” your registration before noon, March 27 — but watching this tutorial video is the next best thing! See as Christine talks you through the registration process from start to finish. A great way to prepare for the big day! We know everyone learns differently, so in addition to the video above, we also created this illustrated, written step-by-step tutorial so that you can explore and learn at your own pace. Click here to view it in your full screen. Registration opens on Wednesday, March 27– any mail-in registrations received before this date will not be accepted. There is a $10 processing fee for mail-in registrations. Christine coordinates the many facets of the Foundation’s vibrant Field Trip Program. 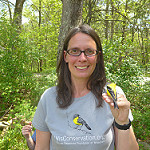 Passionate about showcasing Wisconsin’s amazing natural treasures, she has organized well over 2,000 Field Trips since joining NRF in 1997.